Hip & Knee Joint Replacement on the NHS. As a Veteran, you can ask for a referral to a specialist Orthopaedic Clinic at the Robert Jones and Agnes Hunt Orthopaedic Hospital where there is a specialist Veterans Clinic run by Lt Col Carl Meyer. In one case a colleague applied for a referral on 16 March, and on 3 May had a hip replacement, a total wait of just over 6 weeks. If you don't mind a few days away from the family, he assures us that it is more like a hotel than a hospital, with really good food. If you have a long wait ahead of you at your local hospital, this might be the quickest way to achieve a result. What is it? A service for Military Veterans to have their hip or knee arthritis assessed and, if appropriate, have joint replacement surgery, a service that is led by Lt Col Carl Meyer, who specialises in such areas. Lt Col Meyer is an Army Reserve officer who has been on three tours to Afghanistan and one to Iraq. He is an Orthopaedic Trauma Surgeon with 16 Medical Regiment, 202 (Midlands) Field Hospital. It is a service available for anyone who has been in regular military service, including national service. The service is centred on The Robert Jones and Agnes Hunt Orthopaedic Hospital, NHS Foundation Trust (RJAH), Oswestry, Shropshire, SY10 7AG. A centre of orthopaedic excellence specialising in lower limb replacement surgery. Outpatients clinics are held fortnightly, normally on a Wednesday. You must ask your GP to refer you to the VETERANS HIP & KNEE SURGERY SERVICE at Oswestry making sure that he specifically mentions Lt Col Meyer and ask your GP to include the NHS Issue code for military veterans AND your service number in the referral letter. Your records at your GP need to be annotated with the NHS issued codes for military/veterans, take photocopies of your discharges book/certificate, you will be asked for proof that you are a Veteran. You should all apply to the MOD under the Freedom of Information Act for your FULL Military Service Records (and, in the Comments Box, ask to include your Medical Records). You should have done this as soon as you were discharged. It is a FREE service. There will be reams of computer print-outs which you then keep in a clip file. 2. Getting the money from the NHS. However, the more operations he performs, the more money the NHS will give him, which means the more procedures he can perform. If you are members of other military Facebook sites/Websites/Discussion Boards, then please copy this to them and let as many Veterans know about this brilliant service that's just for them. It's about time we Vets received something back for our years of loyal service. Clinical/Research Interests: Lower Limb arthroplasty-hip and knee. Young adult hip and knee arthroscopy. ​There is a service for military veterans to have their hip or knee arthritis assessed and, if appropriate have joint replacement surgery. We understand that the service is led by Lt Col Carl Meyer, Military Consultant Hip and Knee Arthroplasty Surgeons at Oswestry’s Specialist Orthopaedic Hospital. 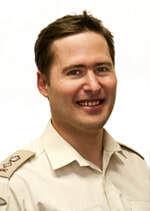 Lt Col Meyer is a regular serving officer who is an Orthopaedic Trauma surgeon with 16 Medical Regiment Colchester. The service is open to anyone who has been in regular military service, including National Service. It is based at the Robert Jones and Agnes Hunt Orthopaedic Hospital NHS Foundation Trust (RJAH), Oswestry, Shropshire; a centre of Orthopaedic excellence specialising in lower limb replacement surgery. To obtain an NHS referral please ask your GP to make a named referral to Lt Col Meyer at the Veterans Hip & Knee Surgery Service in Oswestry.